Helping businesses and organisations succeed online. Vass Media provides ongoing social media management for your business so that you can focus on what you love to do. As part of the package, you’ll receive photography and video services that will give you quality, creative content. 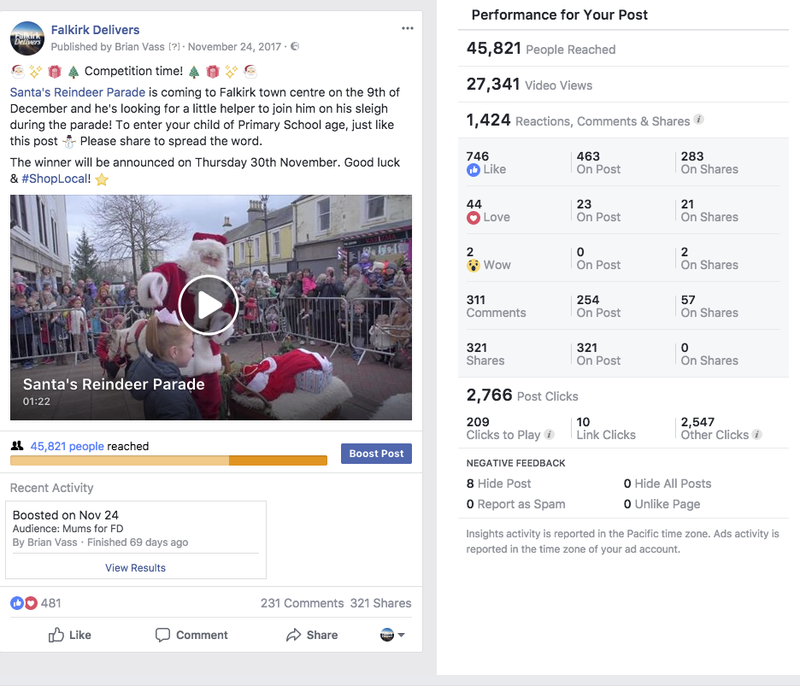 As well as providing engaging, professional, and branded content, Vass Media has also delivered several successful social media advertising campaigns for clients such as Visit Falkirk and Falkirk Delivers. Following a successful Growth Fund application to Visit Scotland, Visit Falkirk and Falkirk Delivers commissioned Vass Media to produce four tourism films over the course of a year promoting Falkirk and the surrounding area and promote the films through social media advertising to maximise the reach of the films and target people in specific locations in the UK. You can see all four films in the video section. 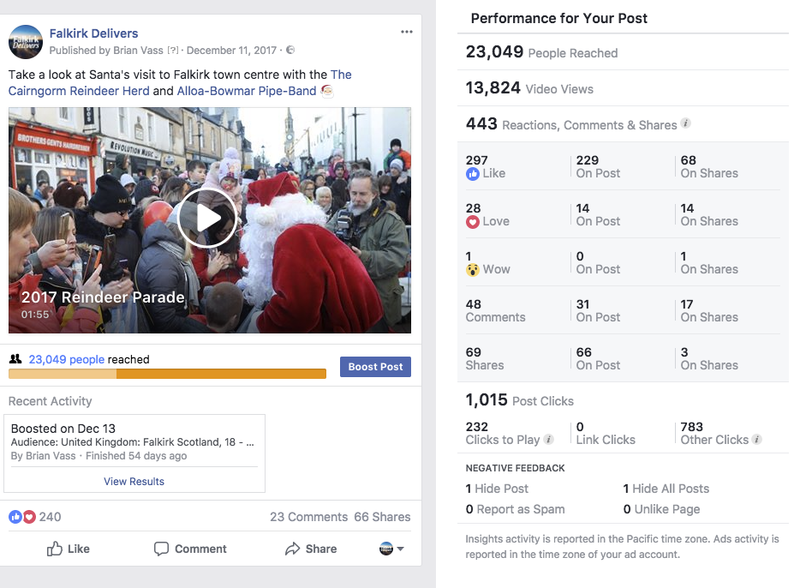 All outcomes, from video quality to social media engagement, exceeded expectations and outperformed all targets, with the final views on social media at 1.4 million. These videos also formed a core part of our autumn marketing in partnership with Falkirk Council, a campaign which used Facebook to promote the videos and other Falkirk content to visitors and direct them to visitfalkirk.com. In my capacity with Falkirk Delivers as Project Manager of the Visit Scotland Growth Fund campaign, I needed to find a videographer with experience of running social media campaigns and was delighted to contract Brian of Vass Media for this role. Falkirk Delivers is Falkirk's Business Improvement District and runs a variety initiatives and projects throughout the year to increase footfall, support businesses and improve the town for shoppers. They hold a variety of events on the run up to Christmas and promote these to the public, as well as raise awareness about local businesses and encourage people to shop locally and support the town centre. Using various social media platforms, Vass Media produces content using photography, video, competitions and giveaways with an advertising budget to maximise engagement and reach. 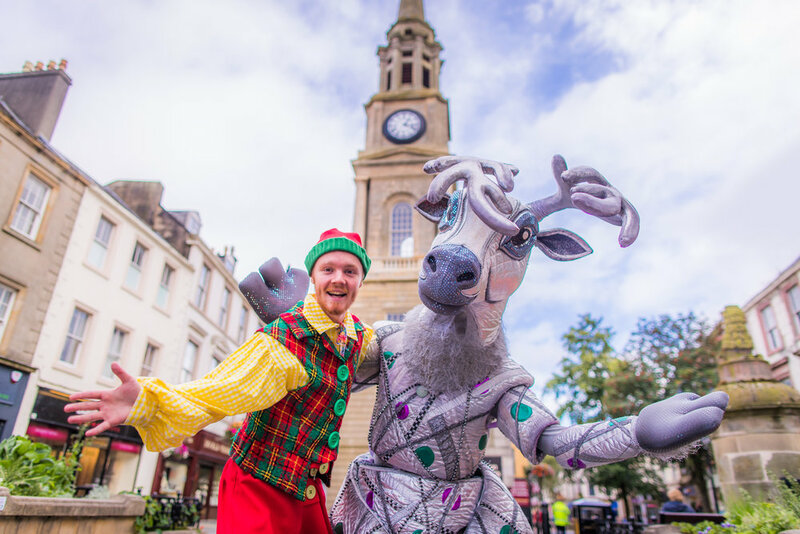 In 2016, Falkirk Delivers won an Award for Digital Engagement from the Association of Town Centre Management following the success of these Christmas campaigns.